Eating fresh raw foods is finally becoming a mainstream diet. As more and more people wake up to the fact that their bodies, minds and habits are all part of the same scene that is out-picturing in their lives and that in order to display perfect health and vitality each one needs to be balanced and healthy. Switching to eating fresh raw foods during our regular meals such as breakfast, lunch or dinner is a challenge but is there a way to eat fresh when we’re in the mood for a sweet snack or when enjoying dessert? Not if we stay balanced. Balance is always the keyword and the best way to do that when incorporating a sweet treat into your diet is to balance the sweet by using totally natural…in their natural state foods to create these treats with. Chemicals, additives, preservatives, sugar and artificial sweeteners that lace the treats we eat do not belong in a healthy body. Incorporating as many “raw” ingredients into your treats shifts everything towards better overall health and well-being rather than adding destructive elements to your body. Raw ingredients contribute health-promoting vitamins, enzymes, fiber and healthy fats. They are easy to make, cost a reasonable amount (especially when you gauge it against what you would pay for medical care on the other end)…and can be made in a reasonable amount of time. Raw desserts are one of the answers to getting healthy unprocessed food into our bodies and those of our families where they can work their magic…the magic of nutritional transformation. Prevent obesity, prevent disease and enjoy better nutrition enjoying recipes so tasty you won’t miss the wheat, gluten, sugar, and unhealthy fats that are present in old fashioned cooking and baking methods. When you think about it, it’s a no brainer. Why indulge in treats and desserts that only make you feel guilty and icky afterwards and are destructive to your body when you can indulge in homemade raw desserts and treats that you have created for yourself. Soak 1 cup dates for 30 minutes to soften then drain. Leave remaining ½ cup dates unsoaked. Blend almonds, walnuts and both soaked and drained and unsoaked dates in food processor until chunky. Add cored and peeled (unpeeled if preferred) roughly chopped apples into blender with raisins and cinnamon and blend until desired consistency. Roll into small balls and set in fridge. 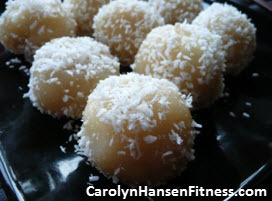 Can be rolled in cinnamon or coconut if desired. Can also be put into the bottom of a glass pie dish, placed in fridge and cut into bars when set.